Though primarily known for his work with two indelible vocal groups of the 1950’s, Bobby Nunn also moonlighted occasionally as a solo act as well as being paired with female vocalists in duets at the whims of various record labels. Nunn was born in Alabama in 1925 and grew up being exposed to the many musical troupes that traveled the south during that era, working as a boy with one vaudeville act known as The Brownskin Models Revue. At some point during his youth his family settled in Detroit, among the many Southern migrants looking for better working and living conditions up North. After coming of age Nunn joined the Armed Forces where he honed his musical skills and when he received his discharge he headed to Los Angeles seeking to make a career as an entertainer. Entering an amateur contest at Johnny Otis’s Barrelhouse Club in 1948 as part of a music/comic duo with Leard Bell, the enterprising Otis recruited both men for his growing repertory group. Bell worked as a drummer while Nunn was convinced to pair up with a vocal group known as The A-Sharp Trio who in short order became The Robins. It was with The Robins that Nunn would remain for the next eight years as their bass lead before he and fellow Robin, Carl Gardner, followed the writing/production team of Jerry Leiber and Mike Stoller across country to form The Coasters in 1956. Nunn would remain with them only two years by which time they’d scored a string of huge hits. During all of this he found time to cut occasional solo sessions beginning in 1949 for Dootsie Williams’s newly formed Blue Records (and later DooTone) as a baritone and over time he’d guest on other records, particularly those of Little Esther with whom he recorded the memorable duet “Double Crossin’ Blues” while both were still associated with Johnny Otis. 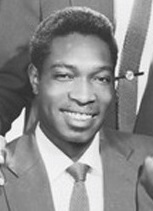 Nunn would cut some sides under his own name in the early 1960’s as well as sing back up for others before reviving The Coasters name for live gigs once the still-active group he’d left saw their recording opportunities dwindle in the mid-1960’s. Ironically his act, the Coasters Mark II as they became known, was made up of mostly ex-Robins and he led them until his death in 1986.